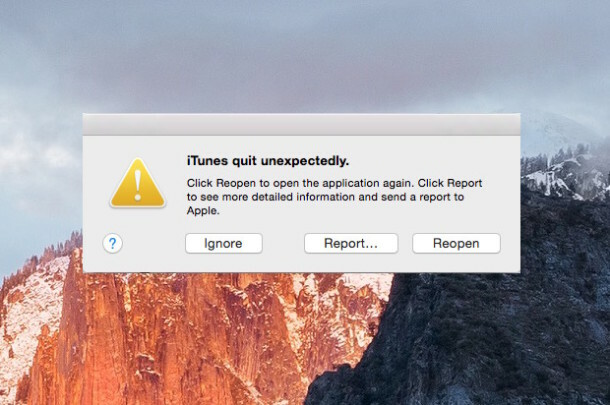 Advanced Mac users who are either in development or another field which experiences frequent app crashing may find the persistent Crash Reporter windows with the ‘App quit unexpectedly’ message to be a nuisance, interfering with their workflow in OS X. While one longstanding option is to disable the Crash Reporter dialog completely in OS X, perhaps a better approach is to send those crash reporting dialog boxes into notification center instead. To be clear, this does not disable the Crash Reporter dialog windows, and it has no impact on crash logs themselves, it simply transforms the crash alert into a Notification within the Notification Center of OS X. If you click on the crash report notification, the regular Mac crash report screen will open as usual. Hit return and that should be all there is to it, the next time an app crashes it will appear as a notification rather than a dialog window. You can test it out yourself by intentionally crashing and beach balling an app or using force quit on a busy application in the ‘not responding’ state. 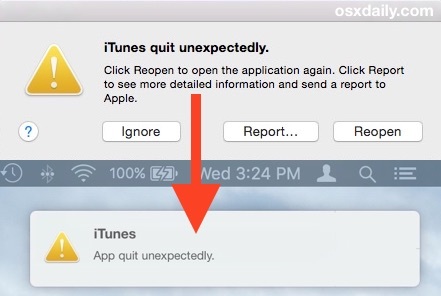 Now if you crash an app it will open the typical alert dialog on the Mac. This should work with any modern version of Mac OS X, a big thanks to Franz D. for sending in this tip! Neat! I’m not a particularly advanced user (nor am I computer illiterate — non-techy, reasonably skills in that context). Is there any reason I shouldn’t do this? This offers no benefit to users who do not regularly encounter the crash reporter dialog. This is for developers and advanced Mac users. Sure it does. It doesn’t happen “regularly,” but it’s still annoying when it does. Anyway, my question wasn’t what benefit I get, it’s whether there’s a reason not to do it. Anon answered. No reason. The only reason it’s not a default is that I think Apple wants people to write crash reports. I never did anyway. is `UseUNC` a new option? is it a dictionary type option? could someone explain the process of discovery for this? also, i suppose you could redirect all system and user app dialogues thru NC in this manner? if so, NC can be configured to be more like growl used to be? I copied and pasted the command, then tried adding a sudo to it but if I force quit anything I do not get any notifications. Adding sudo does nothing here and force quiting applications doesn’t help either. Force quit does not make the app crash, it just quits. You’ll just need a real application crash for you to see this. Exactly, the mention in the article is about using force quit on a ‘not responding’ app which will trigger the crash reporter, but force quitting by itself does not crash an app. Matt you have to crash the application. You can sometimes do that by force quitting an app mid of a process but best to just wait for one to crash. If you have access to the Apple Developer site and the Auxiliary Tools for Xcode package, you’ll find an app inside called “CrashReporter Prefs” which is a UI that allows you to set up CrashReporter in headless, full, or standard mode, with the choice to use Notification Centre as the output. You may also customise whether or not unhandled exception dialogs (which also occur occasionally) appear; these dialogs allow you to crash the app in the usual way or continue running in an inconsistent state. It’s a nice tip. I have been running CrashReporter in developer mode for a long while now, using NC for output. Processes die all the time in daily use (yay software quality!) and it’s nice to have substantial records of the fact. I use this. It’s very helpful. When is apple going to fix the problem permanently? I think this is a very good tip – Thanks! I’d love to be able to remove the notification center completely.